The Slack button is the simplest way to offer your service to teams using Slack. A Slack button app gives you incoming webhooks, slash commands and bot users wrapped in OAuth. You write the commands and the webhook that your app needs, and configure the options for your users. With just a few clicks, your users can add your app to their Slack workspace and start receiving notifications, issuing commands and chatting with your bot. The Slack button is also a key aspect of sharing your Slack app in our Application Directory! 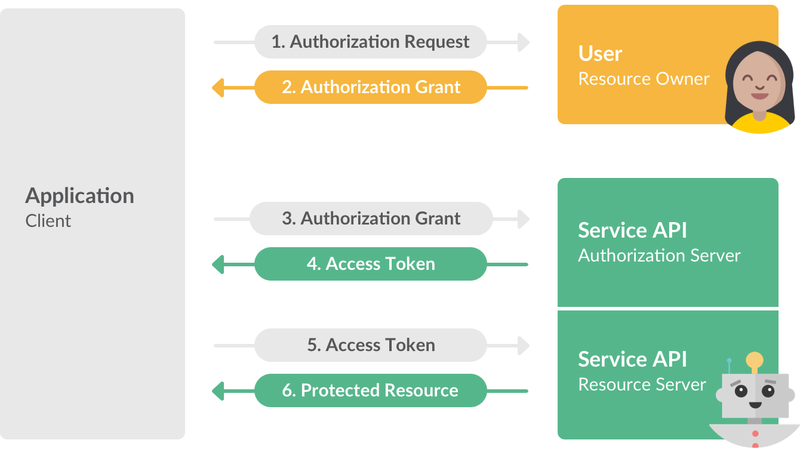 When someone clicks on the Slack button in your website or app, the OAuth process begins by asking them to choose their Slack workspace and account. The app will then configure an incoming webhook, slash commands and/or a bot on their behalf. Users will no longer need to copy and paste HTML, webhook URLs, or API tokens! Here's how to build a Slack app that can be added to any workspace via the Slack button. It will let your app send messages to Slack (via incoming webhooks), install slash commands and/or add a bot user on their workspace. From a user experience standpoint, the flow is identical to a normal OAuth 2.0 flow. Before you do anything else, you'll need to create your Slack app to get a client_id and client_secret to use with OAuth. After saving your app, you'll have the option to attach at least one slash command to your app so that workspaces installing your app will also be able to use your slash commands. Note: Slash commands attached to apps must point to URL on your servers with a valid secure certificate. After saving your app, you'll have the option to attach a bot user to your app so that workspaces installing your app will also be able to converse with your bot. Looks like you don't have any apps yet. Note: the incoming-webhook scope is designed to allow you to request permission to post content into the user's Slack workspace. It intentionally does not include any read privileges, making it perfect for services that want to send posts or notifications into Slack workspaces that might not want to give read access to messages. For this reason, it cannot be added alongside the read, post, and client scopes. After someone accepts or denies the OAuth request, Slack redirects them back to your site via the redirect URI (which you passed into the OAuth flow as the redirect_uri parameter, or set up when you created the app). If the OAuth request was accepted, the URL will contain a temporary code in a GET code parameter, as well as the state you provided in the previous step in a state parameter. If the states don't match, the request has been created by a third party and the process should be aborted. The team_name field will be the name of the workspace that installed your app, the channel will be the channel name that they have chosen to post to, and the configuration_url will be the URL that you can point your user to if they'd like to edit or remove this integration in Slack. You can use these fields to personalize the UI on your end to give context about where the incoming webhook will be posting and how they can edit or remove the integration. If your button is used to install a bot user, then pay special attention to the bot node of the JSON response. It contains bot_user_id and bot_access_token values, which you will need to use whenever you are acting on behalf of that bot user for that workspace context. Use the top-level access_token value for other integration points. You can now start sending messages via the incoming webhook, listening for and responding to slash commands and initiate or respond to conversations with your bot! Denying authorization: If the user denies your request during the OAuth flow, Slack redirects back to your redirect_uri URL with an error parameter. 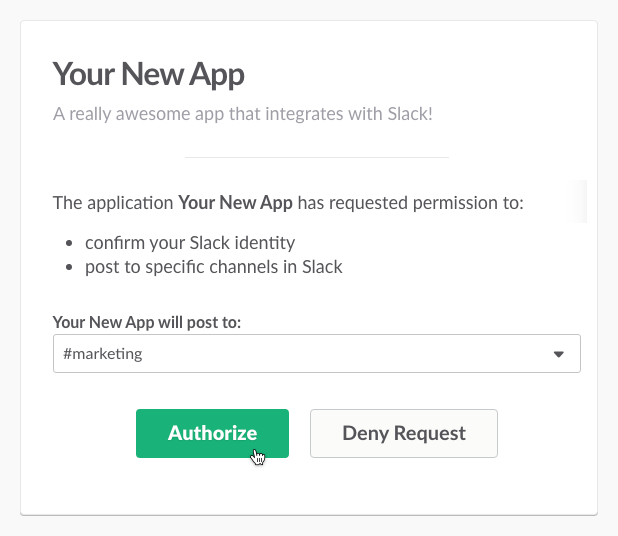 Revoking authorization: Users can revoke the incoming webhook URL from within Slack. If a user does so, you'll receive an HTTP 404 response with a body of "No service" when you make requests to the incoming webhook URL. If this happens, you should stop posting messages to the that particular incoming webhook URL. Bot naming error: Since your bot inherits the name of the app, and is beholden to the same limitations of real user names, your app name can't be over 35 characters if it has a bot user, and it also can't be called "Slackbot". Email integrations@slack.com with any questions, feedback, or ideas that would help you get more use out of this, and we'll be more than happy to help. Create a Slack app to package and distribute your incoming webhook and share it in our application directory.